15th Century Transylvanian Prince Vlad is forced to protect his kingdom from the onslaught of the expanding Ottoman Empire as the Turks threaten to invade his lands enslaving teenage boys for forced conscription to the Turkish army. Through many bloody battles, Prince Vlad, suitably played by Luke Evans (The Fast and the Furious 6) gets the nickname of the Impaler who impales invading armies and unfriendly villagers on gruesome stakes. Dracula Untold starts in 1442, the height of the middle ages, with Prince Vlad and a group of men entering broken tooth mountain, whereby hidden in a dark cave an evil force looms. That force is an immortal vampire who made a pact with a demon for his eternal bloodsucking powers. As the Turkish forces advance on Transylvania headed by Sultan Mekmet downplayed by the swarthy Dominic Cooper (The Duchess, The Devil’s Double) threatening to enslave the male population of Vlad’s precarious kingdom and also his precious son Prince Ingeras played by Art Parkinson. Craving supernatural powers, Vlad rushes off into the evil liar and confronts his fears by sipping from the blood of this manipulative master vampire, wonderfully played by Charles Dance (last seen in HBO’s Game of Thrones) in exchange for extraordinary strength and acute nocturnal abilities. However like all pacts with the devil there is always a catch. If after three days Vlad drinks human blood again then he will be immortalized as a vampire forever and as per his order of the Dragon, will eternally take the title of the infamous Dracula. However Vlad the Vampire in the course of three days shies away from shining silver, sunlight and wooden crosses, revealing his true form to his disconcerted legions. With all the mythologies and movie histories surrounding Dracula and vampire, director Gary Shore refreshingly decided not to go the gory or sexually explicit route and in turn creates a tame if not entertaining historical version of Dracula in Dracula Untold, assisted by some great visual effects especially the fight sequence between Vlad and Mekmet amongst bags of glittering silver. Whilst this film is not Twilight or the elegant Neil Jordan film, Interview with a Vampire, Dracula Untold is a mild yet enjoyable middle of the road historical epic about the origins of this mythical bloodsucker giving more credibility to his alter ego as a merciless Transylvanian Prince Vlad, who was willing to sell his soul to the devil to save his mountainous kingdom. Unlike Francis Ford Coppola’s 1990’s film Bram Stoker’s Dracula, this film is a less ambitious version of the iconic bloodsucker helped by good performances by Evans and Gadon with more seasoned actors like Charles Dance and Dominic Cooper adding some credibility whilst the film focuses more on the historical origins of Dracula than any of the contemporary post-Victorian Gothic reincarnations. 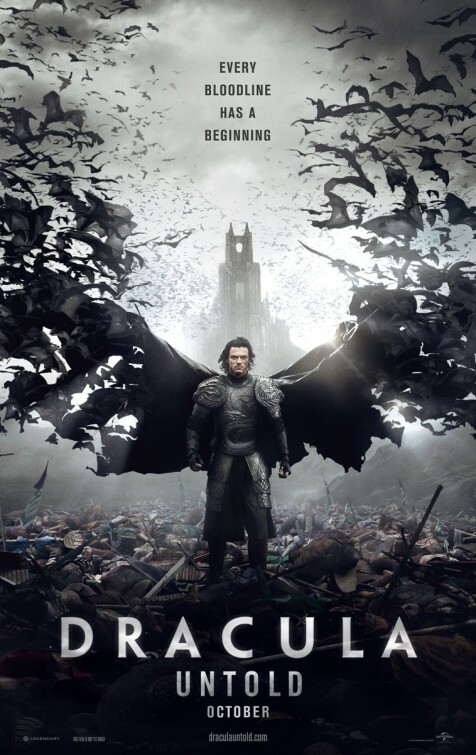 Dracula Untold is recommended viewing for vampire fans and those that like their blood sucking a little light on the veins, moving the film swiftly out of violent epic mode and more into the historical fantasy genre.